If you know a prospective W student, contact the Office of Admissions at 662-329-7106 or cderden@admissions.muw.edu. To schedule a campus visit, call 877-462-8439 (toll free) or visit www.muw.edu/admissions2/visitform.htm. The web site also offers a live online chat option. 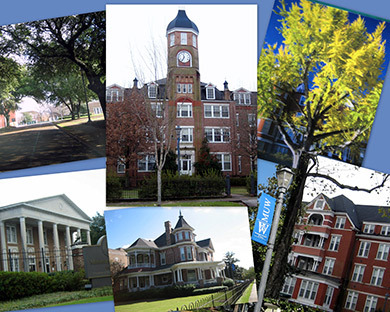 You can also direct prospects to the Mississippi University for Women Facebook site or Twitter account. When it comes to recruiting a new generation of W girls and guys, alumnae play an important role in encouraging potential students to consider our alma mater. Part of our collective responsibility as supportive MUW graduates is to guide dedicated, smart and enthusiastic students to the W and show them all of the benefits the university has to offer. And with statewide budget cuts, it is more important than ever to increase admission rates by bringing more students into the MUW fold. So how can you play a part in student recruitment? The easiest way to accomplish this is to talk about your own experiences at the W. Remember: it’s never too early to start recruiting future W grads! Talk to the high school students you know — your children, grandchildren, nieces, nephews, their friends — and students with whom you may work — as a teacher, mentor, boss — and tell them about your own experiences at the W. Share your stories of academics, campus life, social clubs and other activities, and all of those special memories that are unique to the W experience — songs, traditions and the unparalleled campus camaraderie. If your local high school or town hosts a college fair, volunteer to represent the W! If the W does not have a table at your local fair — MUW’s admissions counselors are wonderful but cannot be everywhere at once, especially if your high school is far away from Columbus — contact the Admissions Office for materials and pertinent information about the university so you can set up a W table yourself! Whenever you have the opportunity, bring potential students back to campus with you when you visit! Homecoming in April and Welty Weekend in October are particularly great times to bring students to campus to see some of our best traditions at work. Once you have identified interested potential students, what is the next step? Cassie Derden, the W’s Director of Admissions, says the best thing alums can do is contact her office and pass along potential students’ information. “Send me an e-mail or note which would include the student’s name, address, phone, email, grade level, and high school attending now,” Derden explains. “Or alums can call our office at (662) 329-7106 to give us their leads.” Either way, it is important to get the interested student’s information to Derden as soon as possible so that the admissions team can send the student information about the university as well as try to schedule a campus visit, an all-important factor in drawing potential students to the school. Let’s all do our part to help the Long Blue Line continue to grow! Brandie Ashe ’07 is a freelance writer/editor who lives in Lucedale, Miss.